May 2, 2014 Tanisha made her first trip to states and competed int he shot put and discus. She finished 10th in discus and 6 in shot put throwing a 38-1.25 in the rain. 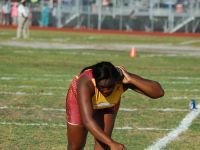 April 16, 2014 Tanisha qualified in both shot put and discus at the 2a regions meet. She finished 3rd in shot put and 4th in discus for the state series meet next month. April 10, 2014 Tanisha threw a personal best in the shot put and discus. She threw a 119-0 in discus and finishing 3rd. She threw a 40-5 in shot put finishing 2nd. April 5 Fla Relays Tanisha threw a 38'9.5" in shot put finishing 8th and threw a 107'3" in disc finishing 9th. April 1, 2014 Tanisha threw a 38'3" in shot put finishing 1st and threw a 103'10" in disc finishing 3rd. 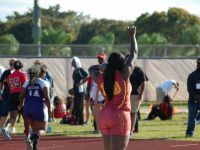 March 18 2014 BCAA Prelims Tanisha finished 1st in shot put with a throw of 37'6" and second with a personal best in discus of 118'6"
March 15, 2014 Steinbrenner @ USF Tanisha threw a pwersonal best in shot put finishing 1st with a 39'4 1/2" She also threw 118'.25" in discus with another personal best. March 1st Tanisha broke the school record with a 37'11" in shot put and finished 2 at the ARch Bishop McCarth meet. February 27, 2014 @ Hallandale against Boyd Anderson, Plantation and Pines Charter. Tanisha finished 1st in shot put with a 26'9.5" and 2nd in disc with a 96'5". Louie Bing February 21, 2014 Out of 64 girls in shot put Tanisha finished 8th with a throw of 35'*. Out of a field of 61 girls in disc she finished 8th with a throw of 102'8"
Tanisha threw a 36'1" and finished 1st in shot put and threw a personal best in disc with a 92'7" and finished 3rd. Tanisha finished 1st in shot put with a 36'4"
Tanisha threw a 80'6" in discus at the Miramar Optimist meet today. The meet was cancelled due to rain. Tanisha finished 2nd in shot put at the Flanagan meet this week. 2013-03-23 Tanisha went 78-2.5 in the Discus at BCAA Championships, placing 13th. Tanisha went 36-11.75 in the Shot Put at BCAA Championships, placing 4th. 2013-03-19 Tanisha went 93-10 in the Discus at BCAA South Qualifier , placing third. Tanisha went 36-0.5 in the Shot Put at BCAA South Qualifier , placing second. 2013-03-16 Tanisha went 34-5.5 in the Shot Put at 4th Annual USF/George M. Steinbrenner Invitational, placing 8th. Tanisha got a PR of 96-2 in the Discus at 4th Annual USF/George M. Steinbrenner Invitational, placing 7th. 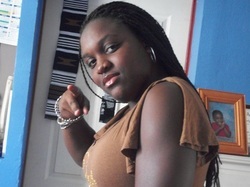 2013-03-09 Tanisha went 88-5.5 in the Discus at Hallandale Invitational, placing second. Tanisha went 32-5 in the Shot Put at Hallandale Invitational, placing third. 2013-03-02 Tanisha went 80-2 in the Discus at Archbishop McCarthy Big Blue Invitational , placing 4th. Tanisha got a PR of 37-9 in the Shot Put at Archbishop McCarthy Big Blue Invitational , placing first. 2013-02-23 Tanisha went 36-8 in the Shot Put at Louie Bing Classic, placing 7th. 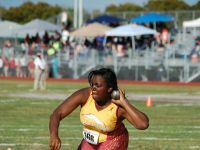 2012-04-24 Tanisha went 35-3 in the Shot Put at FHSAA 3A Region 4, placing 7th.